Goddess Interrupted – A review and my take on mythology…. I´ve mentioned this before: I love mythology. I focused part of my Master´s thesis on the re-telling of MEDEA by Christa Wolf using feminism and new historicism theories. I immersed myself in the evolution of women´s image through the different adaptations of the myth. I also looked at MEDEA through Christa Wolf´s lens in regards to the divided Germany and her own personal history. Summary from Goodreads: Kate Winters has won immortality. But if she wants a life with Henry in the Underworld, she’ll have to fight for it.Becoming immortal wasn’t supposed to be the easy part. Though Kate is about to be crowned Queen of the Underworld, she’s as isolated as ever. And despite her growing love for Henry, ruler of the Underworld, he’s becoming ever more distant and secretive. Then, in the midst of Kate’s coronation, Henry is abducted by the only being powerful enough to kill him: the King of the Titans.As the other gods prepare for a war that could end them all, it is up to Kate to save Henry from the depths of Tartarus. But in order to navigate the endless caverns of the Underworld, Kate must enlist the help of the one person who is the greatest threat to her future.Henry’s first wife, Persephone. Tell me, are there any adaptation of famous stories that you really enjoyed reading? Like you, I love mythology. All I wanted to read about in the 5th grade was the Greek and Roman myths and that love has grown to include the mythology of many cultures, whether it’s Greek, Roman, Norse, Celtic or Native American/Canadian, Japanese, Chinese or East Indian. Another fellow writer is beginning to write a series of stories based on the Greek gods and I can’t wait to read them. I’ll let you know when the first one comes out in print. 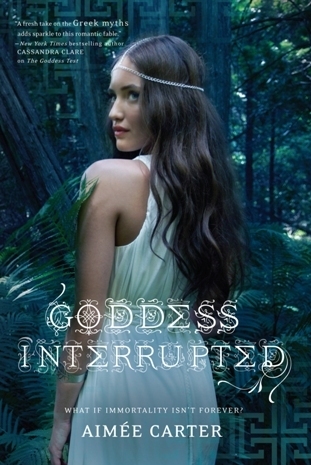 Thanks for sharing your take on Goddess Interrupted. Oh I put in to read this but didn’t get it. I do have both on my TBR list for a later time though. I heart mythology too. I like hearing different takes on the myths. Besides how many different myths are out there about each god or goddess anyways. Side question have you ever read P.C. Cast’s Goddess Summoning series? They are considered romance novels but oh so good. Plus I love the take on the gods and goddesses. That’s a great question – this isn’t a re-working of a myth, but Gloria Naylor’s novel “Mama Day” is a contemporary re-working of Shakespeare’s “The Tempest” which actually probably has roots in mythology. It’s a great story and one of my all time favorites. Sounds like one I will pick up. I ain’t suggesting your content isn’t solid|I mean, I don’t wish to tell you how to run your blog, however suppose you added a post title that makes people want more? I mean BLOG_TITLE is a little vanilla. You could look at Yahoo’s front page and see how they create article titles to get viewers to click. You might add a video or a picture or two to get people interested about what you’ve written. In my opinion, it could make your blog a little bit more interesting.